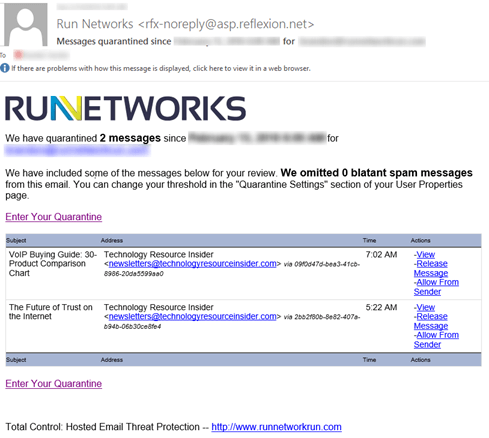 Run Networks recently launched Reflexion Total Control as the new spam filter. In the last few years, McAfee purchased MXLogic, which was then purchased by Intel. Intel announced Q4 of 2015 that they were discontinuing the service and quickly started to retire it. Reflexion is part of Sophos, an antivirus product and is a trusted source. We hope to clear up some questions on how to use the Reflexion service. There are several items we should clarify. You will receive a daily quarantine summary similar to below. You will only receive this if you receive spam. New users may not receive one. You'll see the links to View, Release, as well as Enter Your Quarantine. Each are important. The View link allows you to view the message. It will link to the quarantine and simply view the message. The Release Message link will take you to the quarantine and automatically release the message to be delivered to your inbox. The Allow from sender link will link to the quarantine and always allow from sender. This link also releases from quarantine. If you want to see all messages in your quarantine, this is the link to use. The system only shows you the message it thinks is spam. It will keep other messages in the quarantine, but now show you them in the email. You can click the Enter Your Quarantine link to view all messages. When you click the Enter Your Quarantine, you have to login. Your login is your primary email address. 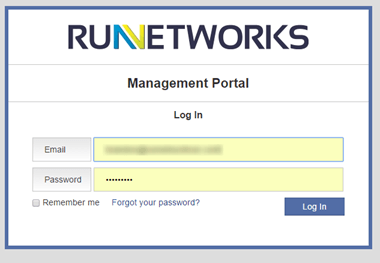 The first time you login, you'll need to use the Forgot your Password link to set a password. This needs to be done prior to logging in for the first time. 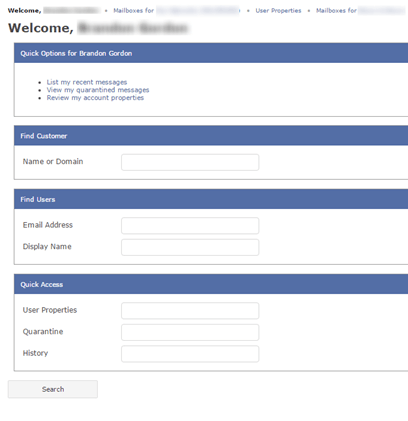 Once you login to view your quarantine, you'll see the Release, Release & Allow, Delete, Delete & Block links. These can be used on each message individually or a group of messages. The Security Settings allow you to adjust your settings to be more or less aggressive. Optimized is a good starting point. 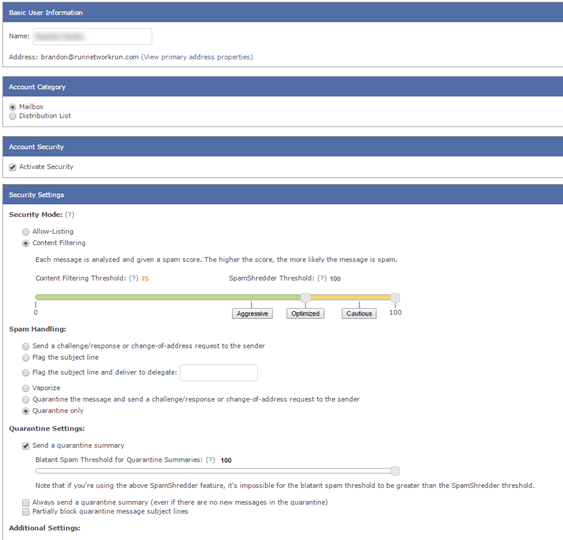 The two slider settings adjust the Content Filter Threshold (Optimized in the photo) and the SpamShredder Threshold (100 in the photo). The Content Filter Threshold is the adjustment for email that the spam filter will quarantine. The spam filter will "Shred" or discard any email above the SpamShredder Threshold. We prefer to not discard anything. Quarantine Settings is the setting that the spam filter uses to keep email in the quarantine, but not notify you. If you receive too much email in the quarantine summaries, this setting will reduce the content of the summaries, but not delete the email. 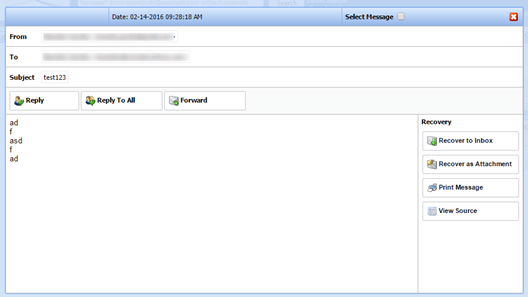 Another feature of the spam filter is outbound Encryption. If you choose that option, the system can be used to send secure, encrypted, and controlled outbound email. Contact us if you are interested in this service, otherwise you should already know how to use it. The system automatically includes a 60-day rolling archive of past email. This also includes a disaster recovery system that you can use to send and receive new email in the case that your email server is down. You can access the inbox and messages shown below from your quarantine. Click Solutions, Login on the left to gain access to this recover and archive mailbox.